Integrated floodplain management is a form of planning and management that seeks collaborative, shared solutions for our floodplain areas. Instead of competing for limited resources, various interests (for example, flood risk reduction, agricultural preservation, and habitat restoration) can develop solutions that create benefit for all parties and that can be jointly pursued. Integrated floodplain management seeks common agreement on visions, strategies, and actions. Integrated management can lead to multiple-benefit projects that meet the needs of more than one floodplain value in one place. Integrated solutions make better use of limited funding and lead to wiser capital investments. Floodplains are a limited geographic area where our values can sometimes collide. Floodplains provide rich, fertile soil for our shrinking agricultural industry. Floodplains provide key habitat for salmon and represent a critical location for habitat restoration. And floodplains include important sites for flood risk reduction projects that can make our communities safer. 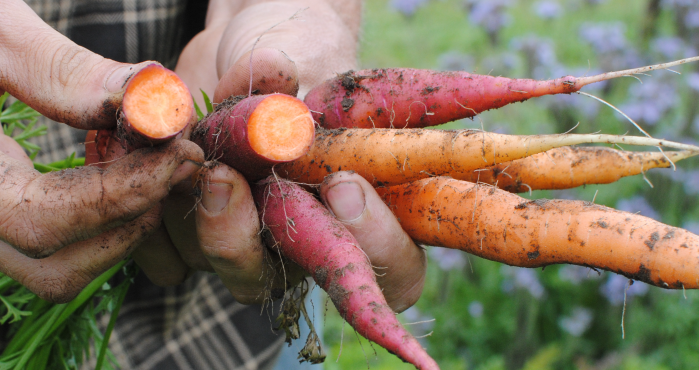 This is why FFTF focuses on three key interests to integrate – farms, fish, and flood risk. Many of our region’s most productive farms are located in floodplain areas. Hundreds of years of sediment deposition across floodplains has built up fertile soil that helps farmers grow food to feed our communities. Agriculture is often considered a compatible floodplain use because, compared to commercial or residential development, farms have less structures at risk from flooding. But the conditions that allow farming to thrive in a floodplain area can be fragile. A healthy floodplain for farming is one in which flood impacts are not catastrophic, where fields are able to drain, and where groundwater conditions are conducive to farming. A healthy floodplain for fish is unconstrained by levees, roads, or other barriers that limit the movement of water and nutrients. Unconstrained floodplains allow the development of side channel off-channel habitats that are important to juvenile salmon as they grow. 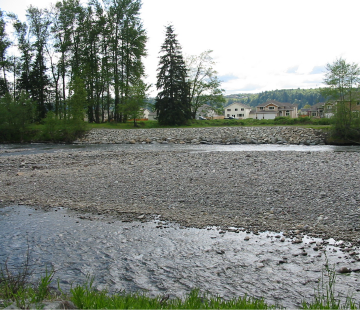 Floodplain restoration such as levee setback projects reconnect large areas of floodplain to the main river, provide habitat diversity, and are essential to the recovery of ESA-listed salmon such as Puget Sound Chinook salmon. Flooding in the Puyallup Watershed is a function of storms and large rain events and is therefore inevitable. What we can control is the damage floods cause when they happen. From a flood risk reduction standpoint, a healthy floodplain is one that can withstand a flood event without major damage. Efforts that move or keep people, homes, businesses, and infrastructure out of dangerous floodplain areas increase our ability to weather flood events. A healthy floodplain is also one where the failure of a single component of flood management infrastructure will not lead to catastrophic results. And a healthy floodplain is one that can recover quickly from the disturbance of a flood. As FFTF Partners work to improve conditions for farms, fish, and flood risk, there are a number of threats and concerns working against all three interests in our floodplains. Floods themselves threaten lives and property, inundate and damage farms, can disrupt habitat, and strain or stress flood control infrastructure. Development in the floodplain reduces the land base available for agriculture, curtails opportunities to restore habitat for fish and wildlife, and puts more people, homes, and infrastructure at risk through increased flooding. Climate change is anticipated to make flooding worse (more frequent and more intense) while also threatening agriculture and salmon through increased temperatures, lower stream flows in the summer, and increased sediment. Flood response and repair costs are increasing at the same time state and federal funding is decreasing. Floodplains by Design (FbD) is an ambitious public-private partnership, led by The Nature Conservancy, Department of Ecology and Puget Sound Partnership, focused on integrating and accelerating efforts to reduce flood risks and restore habitat across Puget Sound’s major river corridors. The goal of FbD is to improve the resiliency of these floodplains for the protection and enhancement of human communities and the health of the ecosystem, while supporting values important in the region such as agriculture, clean water, a vibrant economy and outdoor recreation. The FbD grant program has funded the FFTF work. More information about Floodplains by Design can be found at http://www.floodplainsbydesign.org/.